A cost effective way to increase the number of test points for your Easy-Touch cable tester. * 1500V (HV) adapters required for HiPot above 1000VDC (707VAC). † H2KM-64 adapters required for HiPot above 1500VDC. The Cirris Expansion Boxes are purposely designed in modular form to allow you, the customer, to add only the test points that you need and want. You are not required to purchase large cabinets filled with test points you do have requirements for. Another customer friendly feature of our expansion boxes is that they are easy to add to your exsisting systems. No expensive tools or time consuming contortions are required. 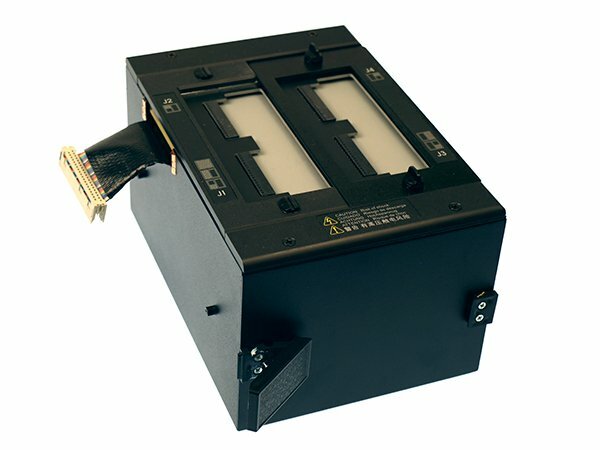 Simply lift the scanners out of their metal work and plug in the supplied ribbon cables, put the electronics back in the can then snap the metal work to the main tester unit or another expansion box. That is all there is to it! Low cost and easy to use, Cirris expansion boxes are ruggedly constructed, portable and easy to install.